"Impact" represents the moment my car hit the center divider of the freeway. It is a painting that is really conceptual art, in that the painting forces the viewer's eye to actually experience a visual collision. 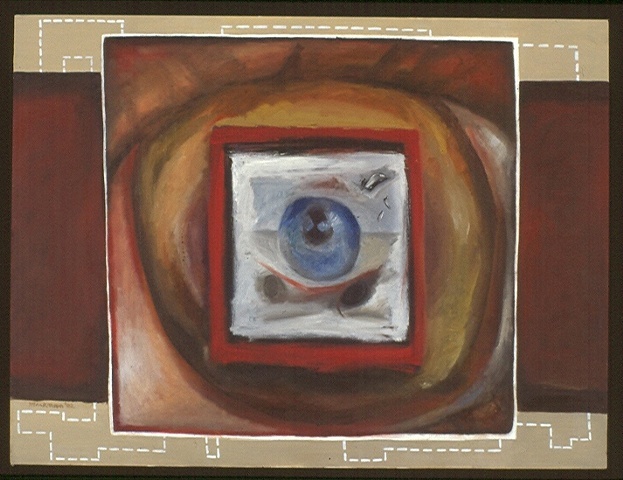 The viewer's eye hits the eyeball in the center of the piece, bounces off that eyeball back into the painting and encounters a second impact with the larger eye behind it. At that moment, as depicted, nothing existed in my world except for my consciousness of an impact-no car, no freeway, nothing but consciousness, violence and impact. This was a very difficult painting. I struggled for a long time with the center part of the painting and kept painting and painting, and then wiping out all that I had done. Finally, the two eyeballs just rushed out of nowhere in a burst of inspiration, and I knew I had it.